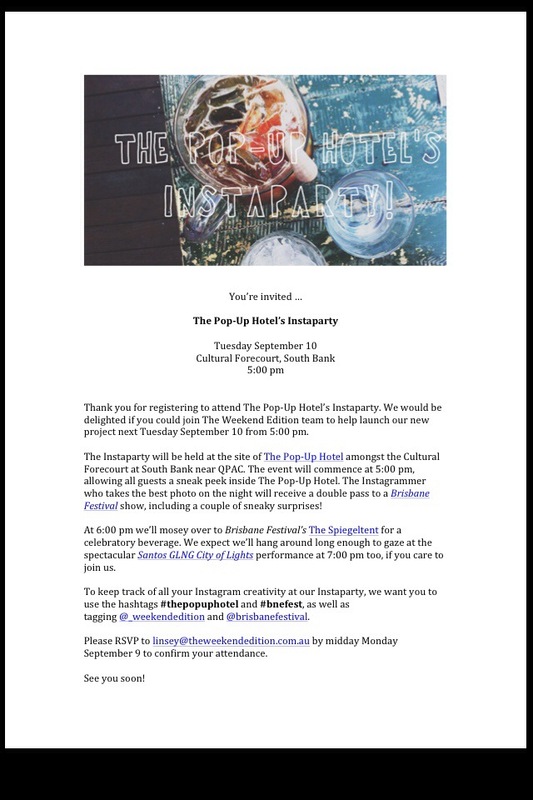 Who doesn’t love getting invited to an Instaparty!? The month of September means that it’s Brisbane Festival time where music, dance, theatre, and comedy take over the city. With the creative juices flowing, The Weekend Edition thought of a brilliant idea to have a Pop-Up Hotel that they set up in different places located near Brisbane Festival venues where guests can spend the night! My friend Paul and I were invited to take a sneak peek and celebrate the launching of the project. Adorable much? The details were so fantastic. I just wanted to kick my feet up and flip through the books in the bell tent! The luxury bed linens are from Sheets on the Line. Coffee would be provided by Cup Coffee and an afternoon cheese platter from Bangalow Cheese Co. with freshly baked bread. Depending on the location, guests would also be provided a nearby yummy breakfast after a dream-filled sleep. After exploring, we headed over to the Spiegeltent for some delicious cocktails! This area was fantastic where many attendees come to grab a bite before heading to the show nearby. I’m really looking forward to attending the premiere of Freeze Frame and watching the Symphony perform Under The Stars as part of the Brisbane Festival. Super September is here!